C'mon Bruce, smile for the camera! DC Comics' heroes are getting into social media. 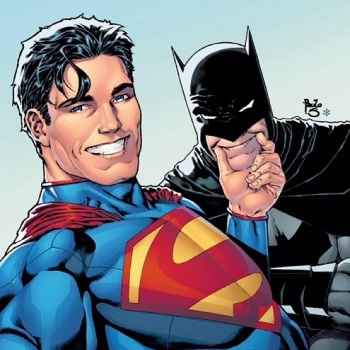 Revealed on Instagram, the variant cover for Batman/Superman #14 is a selfie of the pair. The cover, by artist Paulo Siquiera, shows the Man of Steel and a less-than-enthusiastic Dark Knight taking a selfie. The cover is the first we've seen of DC Comics' variant cover theme for August. DC Comic co-publisher Dan Didio says, "From the people who brought you Scribblenauts, Steam Punk and Bombshell variant covers, August is Selfies cover month in the DC Universe! Yeah, yeah, I know they're silly, but that's the fun of it!" Batman/Superman #14 is due out in October, and there's no word yet on how to nab a copy of the selfie variant. DC's variant themes have produced some gorgeous covers. The classy pin-up posters of DC's heroines, including a Wonder Woman styled like Rosie the Riveter, became variant covers for June. In March, 22 Robot Chicken variants graced the covers of DC's greatest heroes, a promotion for the second Robot Chicken DC Comics Special, which aired in April. Variant covers can be collector's items or incentives for retailers to order more copies of the book. The first issue of BOOM! Studios' Big Trouble in Little China comic series got 14 variant covers, several of which were exclusive to certain stores. At first, I loved this cover, but then I realized how much dread I'd feel if a Kryptonian was forcing me to smile. One slip and Bruce Wayne's going to need some serious reconstructive surgery. I still might try to grab a copy of this variant, if only to take a selfie with the selfie.